Reducing our ecological footprint, creating a more sustainable future and protecting wildlife and wild places – these are initiatives that are near and dear to the staff and board of the Detroit Zoological Society (DZS). Guided by the Greenprint, a strategic plan for operations at the Detroit Zoo and Belle Isle Nature Center, our goal is to inspire others to join us on our Green Journey as we continuously look for ways to live and operate in more sustainable ways. To accomplish this, we started from within. The DZS Green Team was founded in 2002 – before the Greenprint was even conceived – to help minimize the ecological footprint of our operations and to educate staff and visitors about choices that enable us to live a more Earth-friendly lifestyle. Being a part of the team is voluntary; it is comprised of representatives from every DZS department who share their commitment, expertise and time to make the Zoo a greener place for staff, visitors, animals and the planet. The Green Team was a strong advocate for development of Greenprint goals and objectives and has been instrumental in carrying out those policies and procedures. Because of our passion and accomplishments in these areas, we have become a regional leader in sustainable business practices. Recent initiatives include building an anaerobic digester, which will annually convert 500 tons of animal manure and organic food waste into a methane-rich gas that will power the Zoo’s animal hospital. We are also keeping 60,000 plastic bottles out of the waste stream annually by no longer selling bottled water – previously the No. 1 seller at Zoo concessions. As part of this effort, we have free refillable filtered water stations throughout the Zoo and offer affordable reusable water bottles for guests. We also encourage visitors to purchase wildlife-themed reusable bags at our gift shops as we no longer provide plastic bags for purchases. We’ve incorporated permeable pavement into new visitor walkways and a parking lot, reducing storm water runoff and filtering pollutants. These are just a few of the steps we’ve taken on our Green Journey thus far. Green Team members have assisted with projects ranging from educating Zoo visitors about the anaerobic digestion process to sorting trash at zero-waste events. 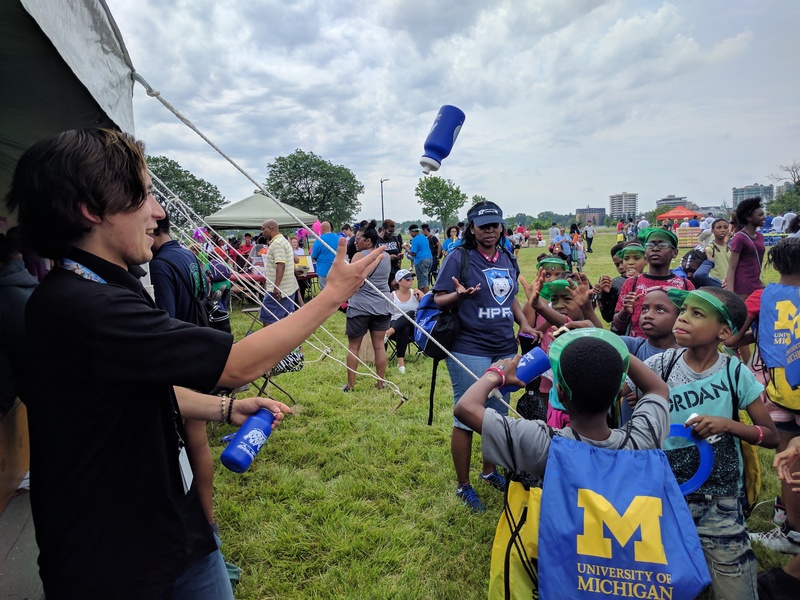 Staff recently volunteered at the 2017 Metro Detroit Youth Day on Belle Isle, which drew more than 37,000 attendees. The Green Team educated participating children on the value of using a refillable water bottle in order to reduce plastic waste in Michigan. 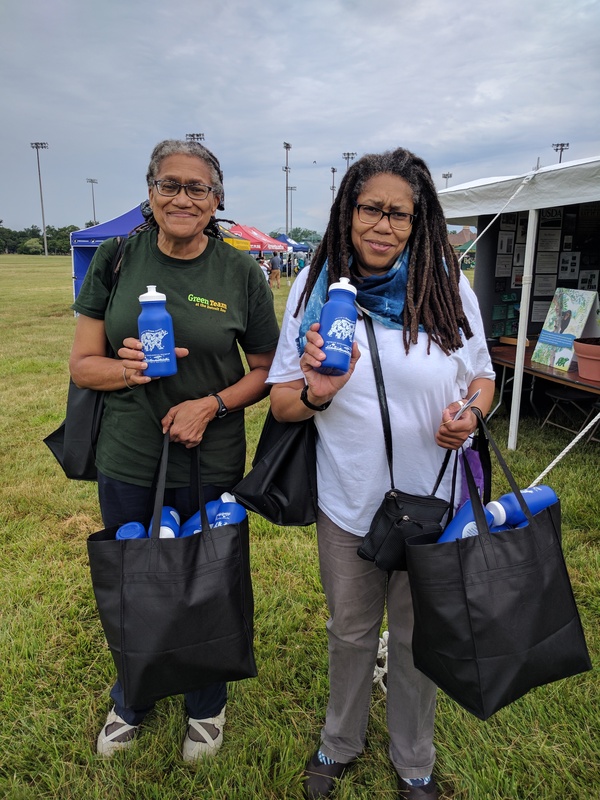 More than 4,000 Detroit Zoo refillable water bottles were given to the children during this event, thanks to a generous grant by the Fred A. and Barbara M. Erb Family Foundation. DZS staff feel so strongly about plastic reduction that we have incorporated this initiative within many of our events. Our annual 5K/10K/Fun Walk, Run Wild for the Detroit Zoo, was one of the first races in the country to eliminate bottled water – instead, refillable bottles filled with fresh, chilled water are provided to participants after the race. Assistance from our Green Team was invaluable as we worked to accomplish this important sustainable task. Prior to the 2016 event, volunteers filled more than 4,200 water bottles for the racers. We are gearing up for the 2017 event on Sunday, September 10 – registration is open. Run Wild raises critical funds for the Ruth Roby Glancy Animal Health Complex and veterinary care for the animals at the Detroit Zoo.